You don't have to limit yourself to decorating the inside of your home. Your patio and yard are extensions of your home, and have unique opportunities to allow you to express yourself and your sense of style. Of course, they present unique challenges as well. Much of your outside decor will be seasonal. The furniture may have to be stored indoors in winter in some climates, and plants may die back. Start out by thinking of what you would like to do in your patio and yard. Perhaps you enjoy barbequing, or maybe you have pool parties with friends. Maybe you just want a quiet sanctuary. Start out by figuring out what will require the most space. If you love to have friends over, you may need a great deal of seating. Or, if you prefer to barbeque, maybe that dream grill will be the focal point. Perhaps you would like to install a fountain. In any case, whatever the focus will be you will likely want to place first, to ensure that other elements do not get in the way. There are great options these days in outdoor furniture. Many are pretty much weatherproof, so you may not need to be so concerned with bringing it indoors in bad weather. Style is important too, and if you haven't shopped for outdoor furnishings recently, the selection available, in terms of comfort and quality, may pleasantly surprise you. One of the most difficult parts of planning your outdoor decor is figuring out what to plant. A basic green lawn works with just about anything, of course, but it doesn't express your style very well... unless basic is your style. You will want to learn how to pick appropriate plants for your yard and garden. You can plant both in the ground and in containers. Most often you will grow flowers in decorative planters, or perhaps a decorative shrub. The containers themselves can be a part of your decor. 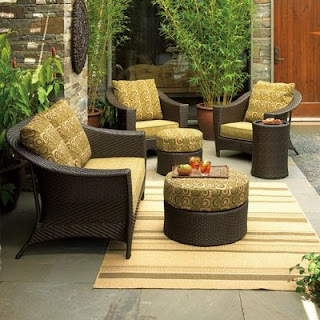 As you plan the natural parts of your yard, consider whether you would like to have any seating out there. A stone bench makes a lovely and durable addition, for example. Statuary might also fit your style. Small water fountains are very popular right now, and very relaxing to listen to. As with lighting, solar powered fountains are available and quite practical. They can be as simple as an urn spilling water into a container below to a series of small waterfalls. The sound of water splashing is a great way to mask noise from the outside world and most people find it very relaxing. Whatever you do, don't skip decorating your yard as you decorate your home. It's a great place for entertaining or relaxing in good weather, or it can be a quiet sanctuary.